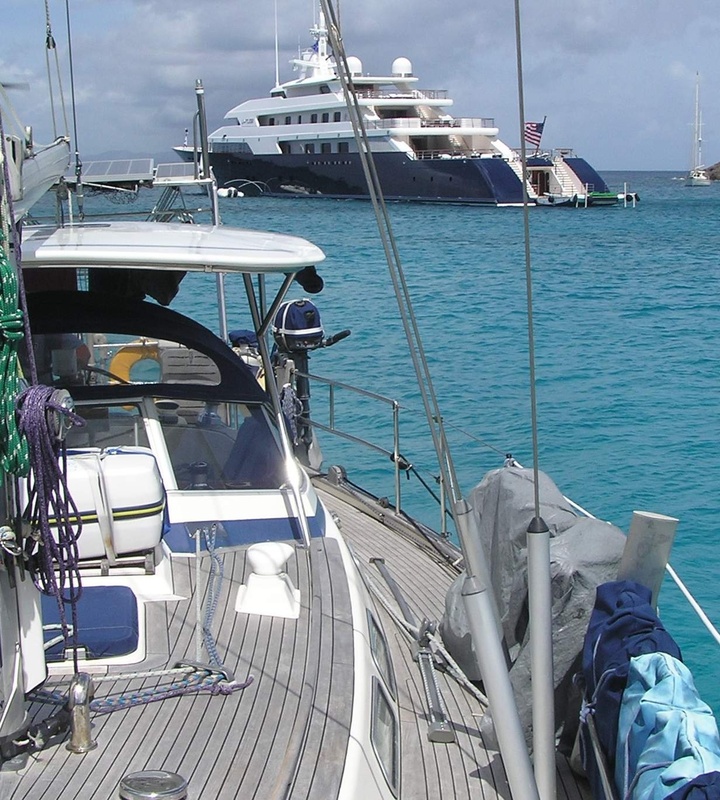 From the rolly anchorage of Montserrat to the chic streets of St Barths is an 80nm voyage. Rather than sail overnight and have to deal with the tiredness which tends to inflict crew on a single night sail, we hoisted the yellow pratique flag and dropped anchor at Ballast Bay, off the island of St Kitts. Our home for the night only as we would leave bright and early the following day to sail the remaining 45nm. With a forecast wind shifting to a north-easterly breeze, motoring anti-clockwise around the south of St Kitts presented a kinder wind angle to sail to St Barths. Turned out to be a good decision as the wind shifted a little more north. Comfortable sailing with full sails and a 20kn breeze was a nice change from beating to wind. Over those two days sailing our Windpilot steered the boat as it hasn’t been used much over the past year and we wanted to make sure it was working well for our upcoming ocean crossing. As we approached St Barths, our chart plotter lit up with dozens of boats sailing clockwise around St Barths and heading directly at us as we sailed in from the south east. Our timing couldn’t have been better – we were approaching St Barths at the same time as the fleet of super yachts in the annual St Barths Bucket Regatta! 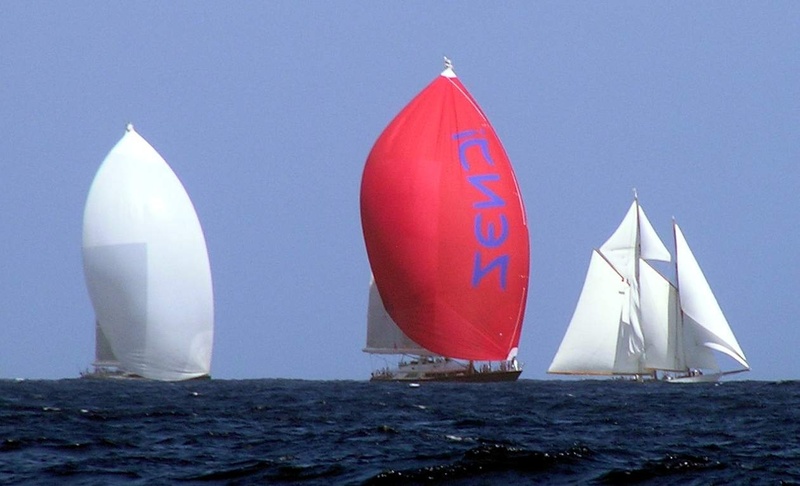 It was a real treat to see such beautiful multi-million dollar yachts with their massive brightly coloured spinnakers billowing high into the as they gibed south around the island towards the finish line just outside the Port of Gustavia. Once they’d gibed, we were to leeward of the fleet all sailing in the same direction. It would have been easy for us to harden the sails, change course and head across the finish line. But with a bicycle, jerry cans of fuel, and dinghy on deck we thought better of it. At least we had full sails and weren’t reefed in case we ended up on one of the finish line photos! We last visited St Barths a couple of years ago, so thought we’d hang around a few days this time as the weather was forecast to be stable. The check-in at the Capitainerie in the Port of Gustavia is a simple online system and retained our boat information from our previous visit, unlike the usual online check-ins at other French islands. It’s all very straightforward and anchoring out in the bay costs around 10 Euros per night – easy. See the man near the mast? This is a very long yacht. You can charter Axioma for US$500,000 per week! Many hands on this yacht. In this part of the world are many of the world’s most luxurious super yachts owned by famous and wealthy folks (doesn’t include us!). I’d love to get aboard one of those beauties and have a look inside. I Googled one nearby vessel – the 76m luxury yacht “Axioma” – and it’s available for charter at US$525,000 per week but they offer discounts in the off-season! St Barths has many fancy restaurants and bars, a chandlery and heaps of other fine stores. But a bar that serves cheap and cheerful food and is usually pretty full with salty sailors using the free wifi is ‘La Selection’. For those that want to recycle unwanted clothing and items, I was surprised to discover a Croix Rouge shop (Red Cross shop) up behind the town. 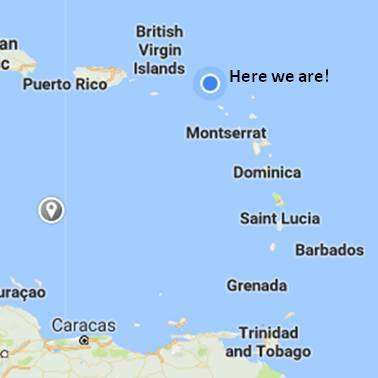 After St Barths we sailed the 15nm trip across to the familiar French/Dutch island of St Martin/Sint Maarten. St Martin is a place to restock, fit, fix and replace things so our stay is never entirely for pleasure. New Lifeline batteries are on their way from the US plus a few other items struggling to find their way here from various places around the globe. Hopefully this time we won’t be here more than we need to! Even the impressive luxury yachts need some down time and the Simpson Bay marinas have many of the finest super yachts in for maintenance of rigging, cleaning, polishing, and no doubt restocking the caviar and cigars. So we’ll be here for a few of weeks to do a few jobs aboard our own little bucket! Aside | This entry was posted in 2017, St Barths and tagged Caribbean. Bookmark the permalink. Hi Ley! They are good batteries. We just got five years out of the old ones, so hopefully the new ones will perform the same or better. Good to see you’re out on the water! Maybe see you again if you get this far up (St Maarten). Cheers. Blue Heeler is no bucket! You must be feeling dwarfed! Coolth has arrived in Melbourne finally. RBYC has a facelift–new forecourt cafe from the old downstairs Olympic room. Hi! Some of these yachts are huge. One near to us has a helicopter on the back! Ha! RBYC facelift sounds good. Enjoy!